Tours of the tuff quarries below the Monteverde Vecchio in Rome and the Catacombs of Pancrazio on the Janiculum are scheduled on December 2, 2017 for participants in the Hypogea 2017 conference, "“Cavità di origine antropica, modalità d’indagine, aspetti di catalogazione, analisi della pericolosità, monitoraggio e valorizzazione”. The excursion sign up sheet is here: http://www.convegnoipogei2017.it/escursioni/programma-escursioni/. Entrance to the Monteverde quarries is through a condominium, so it is necessary to bring a change of shoes. The cost of the trip, including insurance, is 30 euro. Maximum group size is 15. Please send the completed payment form to convegnoipogei2017@sigeaweb.it. 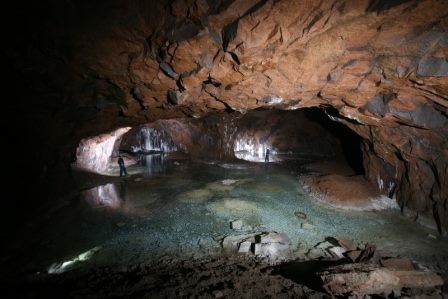 A study of the Monteverde quarries was carried out in 2013 by the speleological association Roma Sotterranea on behalf of Rome's Soprintendenza Speciale per i Beni Archeologici di Roma (press release). The complete conference program is at: http://www.convegnoipogei2017.it/convegno/programma-convegno/.